I often judge a movie by the number of times I check my watch during the showing of it. Score with this 2+ hour film? That means it’s a terrific movie that I fully engaged with. And my children, 10 and 8, were as rapt as I was. 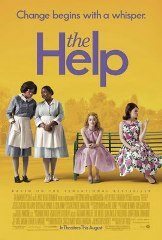 I reviewed Kathryn Stockett’s book, The Help, when it came out in 2009 and I predicted it would be successful. I jumped at the chance for the three of us to preview the movie last week (disclosure: my children and I attended a free pre-screening). The film opens in theaters today. I loved the characters: Skeeter, a recent journalism graduate; Aibileen, a black maid who has a special talent in raising white children (who grow up to become her employers); and Minnie, Aibileen’s friend and also a maid, whose sass gets her into all sorts of trouble. I loved the setting: Jackson, Mississippi in the 1960. Think Mad Men meets Jim Crow. I was born in this time period and I never tire of seeing what kitchens, cars and fashions were like when my mom was raising my sisters and me. My children thought items such as a rotary-dial phone mounted on the wall and a typewriter were SO COOL. They were amusingly puzzled in a short scene that featured Wite-Out. The premise: Skeeter is the only one of her society sisters to notice there is something very wrong about the treatment of the “help” in their households, as well as the unseen lines between races and classes that everybody assumes are real. Despite the stifling social codes that separate them, Skeeter, Aibileen and Minnie decide to tell their stories, risking all to make a subtle change in awareness of imaginary lines. The film sparked quite a discussion on our drive home. We talked about racism, about courage, about how important it is to know what’s right and then to act on it, no matter what people around you are doing. The acting was superb. I always love Allison Janney (Skeeter’s mom), and enjoyed the performance of Bryce Dallas Howard, Ron’s daughter (of Opie fame) as the sinister mean girl Miss Hilly. Viola Davis as Aibileen and Octavia Spencer as Minnie fully become their characters, and Emma Stone was fine as Skeeter. Cecily Tyson and Sissy Spacek have small but pivotal roles. There are criticisms about both the book and the film regarding dialect and how a white woman is required to give voice to the black women. There is probably some validity to this criticism. But if the full-house pre-screening we attended is any indication, a majority of film-goers will come out of the theater with high praise for the flick, as did my children and me. My friend and fellow MileHighMama Gretchen also reviewed The Help. See what she has to say about the film.